Description: In this set of activities, students observe images of fossil shells, ask questions about those fossils, and sort the fossils into categories based on their physical characteristics. Parts 1 and 2 introduce students to the fossils, encourage careful observation, and focus on the scientific practices related to asking testable questions. Parts 3 and 4 address content related to 3rd grade NGSS DCI, as well as the crosscutting concept of patterns. While the content is most closely aligned to the 3rd grade standards, the practices related to asking questions and identifying patterns to categorize data could be useful for a variety of grades. The particular practices, concepts, standards, and related evidence statements for each activity are outlined. The complete lesson plan is presented below (also downloadable). FAQs: Answers to a number of frequently asked questions about the fossils used in this exercises--and more broadly paleontology, fossils, and geology--may be accessed here (also downloadable). In this set of activities, students observe images of fossil shells, ask questions about those fossils, and sort the fossils into categories based on their physical characteristics. Parts 1 and 2 introduce students to the fossils, encourage careful observation, and focus on the scientific practices related to asking testable questions. Parts 3 and 4 address content related to 3rd grade NGSS DCI, as well as the crosscutting concept of patterns. While the content is most closely aligned to the 3rd grade standards, the practices related to asking questions and identifying patterns to categorize data could be useful for a variety of grades. The particular practices, concepts, standards, and related evidence statements for each activity are outlined below. Ask questions o that arise from careful observation of phenomena, or unexpected results, to clarify and/or seek additional information. Give each pair/group of students a set of 10 fossil cards. Without telling them anything about the images, have them write as many questions about the images as they can in 10 minutes. Group brainstorm: have each group of students share their questions with the whole class and make a list of their questions on the board. There will be a lot of overlap—start with one group and have them read out their questions, and have other groups raise hands if they also wrote that question. Put check marks next to the question for each group that asked it. One option to make it more interactive-- assign points: each question is worth one point, and each question no one else thought of is worth two. See which group earned the most points. Challenge students to write 10 more questions, now that they know more about the images. Share and record new questions with the class. Thinking of questions is a good way to encourage students to make close observations of something. Help students see that asking questions about these images also helped them notice and learn things about them. Ask students: What do we know about the things in these images so far? Make a class list of their answers. Students may start by listing the facts they were given about the fossils—record these first and then encourage them to tell you more things they know. Board/poster paper. Save the class list for the next activity! In this lesson, students consider which of the questions they wrote in Part 1 are testable in a scientific manner. While all questions are good questions, science builds knowledge by asking questions that can be tested through an investigation using data, and then testing them. Students are asked to consider what makes a question “testable”, which of the questions they asked about the fossil images are testable, and what data would be needed to test them. Plan an investigation or test a design individually and collaboratively to produce data to serve as the basis for evidence as part of building and revising models, supporting explanations for phenomena, or testing solutions to problems. Consider possible confounding variables or effects and evaluate the investigation’s design to ensure variables are controlled. What does it mean for a question to be testable? What does it mean to answer a question based on data? With the whole class, look at the question list from Part 1. Pick a couple of the questions from the list that are testable and a couple that are not. Ask students if they think they are testable, and why or why not. Discuss briefly. Have students work with their groups from Part 1 to decide whether they questions they came up with are testable or not. Discuss students’ questions with the whole class. Have each group share a couple of their questions that are testable and a couple that are not, and their reasoning about which are which. After a group shares their reasoning, ask the rest of the class if anyone had a similar question, if everyone agrees with the reasoning, or if anyone has other thoughts or questions about the question or reasoning. In groups, have students pick three of their testable questions and think about what sort of data they would need in order to test and answer it. How might they get that data? The goals of this part are to 1) get students to start thinking more broadly about what can be learned from fossils, and 2) give students a topic for thinking about experimental design. If one or both of these are very new ideas, help students get started by talking through one example with the whole class first. Have students write a more detailed plan for testing one question. Give students more information about the location and era, or examples of ways that paleontologists study fossils (see background information section), to help them think of possibilities. In Part 1 students made a class list of things they knew about the fossils at the end of the activity. Ask students to add to that list by making a column of “missing data”-- specific things they do not know about the fossils. To get the discussion started, ask students to think about the data they said they needed to investigate their testable questions. If students suggest additional things they do know, add those to the list from Part 1. The goals of this reflection are to help students recognize what they have learned, and help them see that asking questions and thinking about how to answer them are a good way to learn about the natural world, even before conducting any investigations. In this lesson students examine a variety of fossil images and sort them into categories. Working in groups, students are asked to create three different categorization systems for the images and then share their systems with the class. Students are then given information about the way scientists have categorized these fossils and asked to think about how scientists determined their system and whether it makes sense based on the images alone. Finally, students reflect on the purpose of categorization and what they learned from the activity. 2-a-iii: Students identify and describe patterns in the data, including differences in traits in a group of similar organisms. The relationships between the fossils of organisms and the environments in which they lived (e.g., marine organisms, like fish, must have lived in water environments). That some fossils represent organisms that lived long ago and have no modern counterparts. Fossils provide evidence of organisms that lived long ago but have become extinct (e.g., dinosaurs, mammoths, other organisms that have no clear modern counterpart). 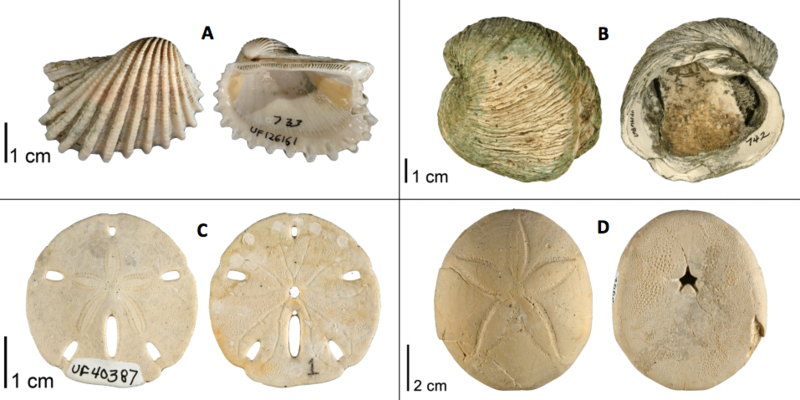 Features of fossils provide evidence of organisms that lived long ago and of what types of environments those organisms must have lived in (e.g., fossilized seashells indicate shelled organisms that lived in aquatic environments). Extensions: have students write the criteria (inclusion, exclusion) for each group. Set of cards for each group. With the whole class, have each group share their categorization systems. Make a list of the different systems. Discuss similarities and differences between systems. In groups, have students look at the system and talk about what characteristics scientists used to make their categories. Ask students to answer these questions with their group. One option could be to have each group of students look at one group of species, and then share with the class. What are some differences among the different species in the same group? Do the categories make sense based on the information you can see in the images? Give students the descriptions of the species. Have them examine and discuss similarities and differences in the species’ behaviors among and within the groups. Ask: why might scientists want to categorize things? What can you learn by making categories? What can categorization help you do? See connections between individual animals, related groups of animals. Extension: Refer back to Part 1. Can students think of more questions to ask about the fossils after making different categorization systems? In this lesson, students look more closely at one family of fossils, the Conidae, or cone snails. Similar to Part 3, students will examine a set of images and develop categories based on physical characteristics. As these fossils are all from the same family, they are more similar than the set of images in Part 3 and will require students to look closely at the physical traits. Working in groups, students will develop categories, name and describe their categories, and compare categories with other groups. They will then examine scientists’ classifications of the species and discuss traits, inheritance, and phylogeny related to the fossils. Tell students they will look more closely at one “group” of the organisms from the first set of cards. They live in tropical marine habitats around the world--especially coral reefs. There are over 700 living species. All cone snails are venomous predators that use neurotoxins to paralyze their prey. Most species hunt worms, but some hunt other snails or even fish! At least one fish-eating species has venoms that are so powerful that they have killed people. Cone snails sting their prey with a harpoon-like tooth, then inject their venom into the prey. Once paralyzed, the prey is pulled into the shell, where it is consumed by the animal inside. Give each group of students a set of the cone snail cards. Tell students that these are fossil cone snail shells from the Plio-Pleistocene fossil record of the southeastern United States. Most of the specimens lived between 2-3 million years ago. Have the students sort the cards into groups. Have students name each of the groups based on the characteristics, and write a description of the characteristics that make a fossil a member of that group. Encourage students to include conditions for both inclusion and exclusion. Have students write the group names and characteristics on index cards, and arrange the card groups on their table. Gallery walk- once students are done making categories, have students walk around the room and look at how other groups categorized the images. Tell students to look at both the groupings and the descriptions, and record similarities and differences to their own categories for each table. With the whole class, discuss the activity—did all the groups make the same categories? Did they all have the same criteria? What were the similarities and differences? Show students how scientists’ classified the images. Turn and talk: have each group briefly discuss how scientists’ system compared to their own, then discuss with the whole class. Where their systems similar? What matched and what didn’t? Optional: Have students look at the 3D images and information about the species on the Neogene Atlas. Think-write-pair-share: Ask students: What does it mean for a classification system to be “accurate”? How do you know if a given system is accurate or not? What does it mean for individuals to be similar? How similar do they need to be? How big of a difference is too big? What does it mean for individuals to be related? Are groups always distinct from other groups, or can there be overlap? Tell students that they are talking about a process called taxonomy. Share some information. Have students read the text on the Philosophy of Taxonomy, or share the major points with the class. Classifying individual organisms into species groups is called taxonomy. There is not a single “correct” answer. Scientists disagree (repeatedly and continuously!) about what should be considered a species and what species an individual belongs to. Classifications are considered hypotheses that are tested and revised as new information becomes available. How do scientists decide which individuals belong to which species? Do scientists always agree on classification? Why or why not? Why might a scientist change their classification system? Is there a “right” answer? Why or why not?